From us to you... the precious gift of freedom from your unbearable workload and space to breathe! What is the main thing that stops you doing all those things you'd love to do? That stops you trying a new idea, starting a new hobby, looking for new opportunities or finishing that long-overdue project. It's time isn't it? It certainly is for most of us. We're all drowning in work – never-ending to-do lists, constant deadlines one after the other, too many emails to possibly answer! If only some of that load could be lifted. If only we could find some space, some breathing room, some time to actually think. It would mean we could try new things, think creatively, do our best rather than just enough to get it done and off our plate. Certainly in work, business growth is dependent on creative thinking and innovation – you need time to do that. If you want to succeed in your career, or make more room in your life for the nonwork stuff, then you need to free up some time. And what's the key to finding time? Delegation. 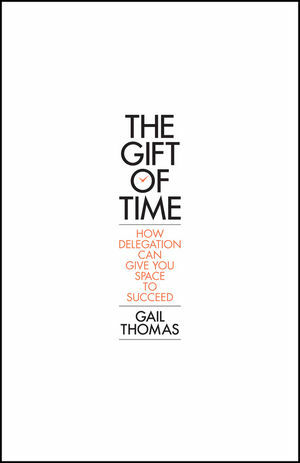 Let Gail Thomas teach you to art of delegation. Stop wasting your time on tasks you're overqualified for and see how you actually can focus on the important stuff. And you won't just learn how to delegate 'down' – Gail will also help you master upwards delegation.